The second of two Humdingers takes place in Leverhulme Park, Bolton.one week before Christmas… but there will be no presents. The Category B class of the senior race will ensure that there is a stocking full of good riders there. Senior, women, vets, juniors 2pm. – More prizes for women to encourage more female entrants, including veteran women. – Power League Building, hot showers, modern changing rooms, carpeted lounge with tables and chairs to eat your butties and warm up, available throughout the day from 10am to 5pm. – Tarmac car park next to the chainging rooms. this is a new version of the course, never been run before, but taking in many familiar routes as well as the odd surprize!! Fully taped off course – like the world champs! Lol. no puncture hazards, so tyres and tubular tyres can be ridden with few worries. 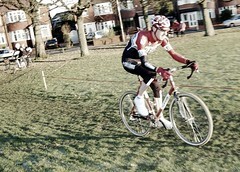 banks and fast competitive cornering sequence. WEATHER LAST YEAR was a 100% frozen course, snow would be good this time, whatever the weather the HUMDINGER goes on! !